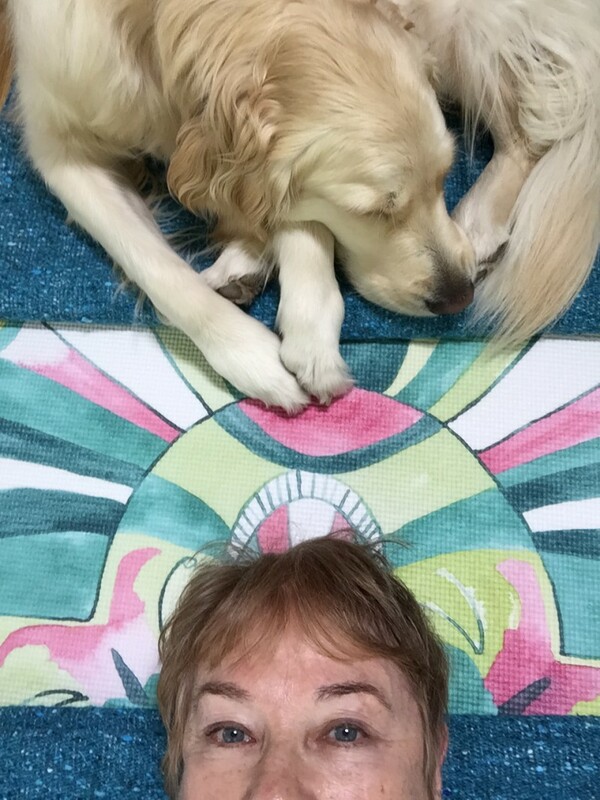 My most potent Teacher, for the past 2+ years, has been our Golden Retriever, Tara. Never in my life have I had such discretionary time to bond with a dog, to study and appreciate her habits, and observe the ways she interacts with her world. What a blessing it has been! Her name inspired by the Tibetan Goddess–The White Tara–this lovely canine is, indeed, my Bodhisattva. 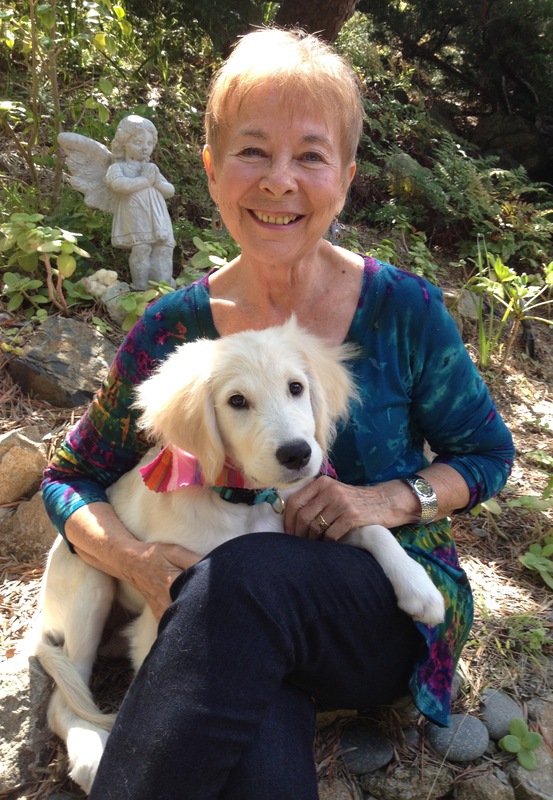 Tara began to teach me, from the moment her 8 week old, puppy paws padded in through our door. While planning to bring a pup into our home (we were dog-less for almost 2 years), I never imagined the immediate therapy factor of Tara. I’d been on a long quest for wellness with little progress, yet keeping the faith for some semblance of recovery from life-limiting, chronic health challenges. I didn’t anticipate how her presence would permeate my Being with healing, enlivening JOY! Nor, how she would teach me, by example, a more loving relationship with my Animal Body. From her first days at home with us, I was mesmerized by Tara’s long, luxurious stretches, each time she got up from sleeping. First, raising her head and neck, then totally lowering the back part of her body, to stretch out her back legs and lower spine. 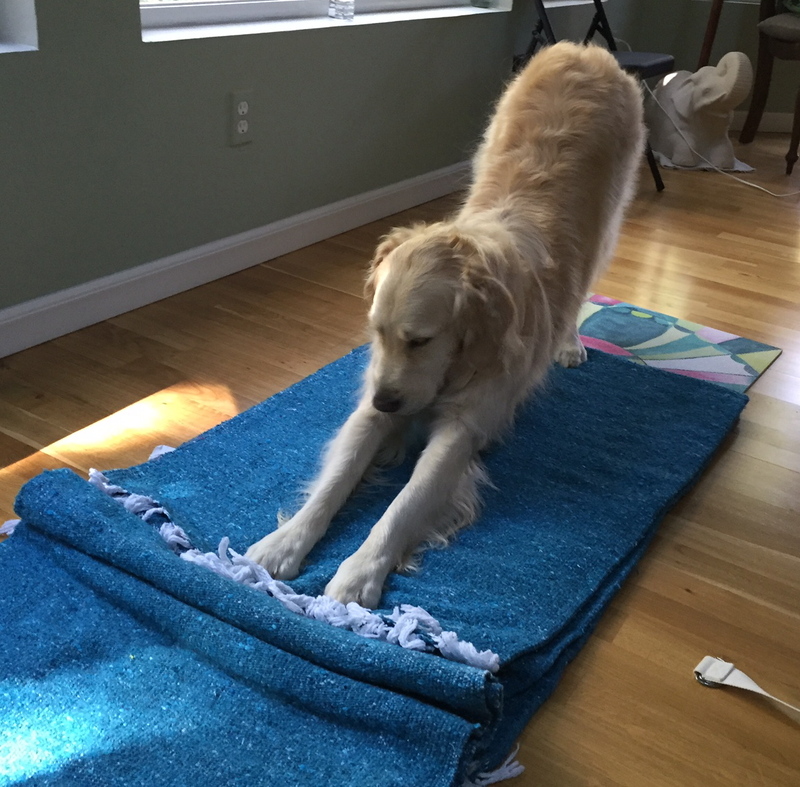 Next, taking the movement forward, a delicious downward-dog type stretch of front legs and shoulders. Observing Tara’s ritual was a giant wake-up call: OMG, this is what an animal body needs…what MY animal body needs! When did I stop following this basic animal instinct? Tara lives in the moment. She pays attention to whatever is here–now. I watch as she makes her first morning trip outside. She raises her nose high in the air. Subtle nose twitches coincide with little puffs of her cheeks. The vast olfactory universe, it’s hers to discern and enjoy. With all of her animal intelligences–more than I’ll ever comprehend–she’s singularly present. And a thousand-thousand other moments of Tara noticing what’s right here. That’s how she, and her Animal Brethren, are wired. With wonder and deep appreciation, I’m reminded to embody the present moment. Tara is a goddess of play. Not just on official play-dates with her canine pack, but anytime she’s awake and feels like playing. 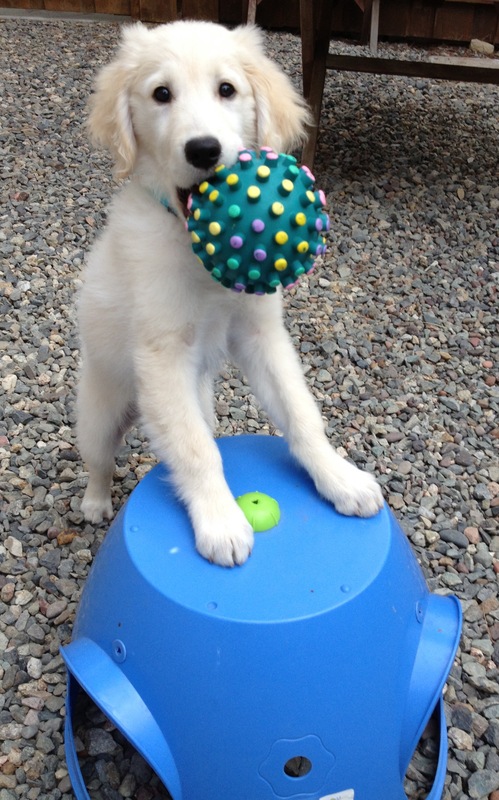 She goes to her basket, selects a toy, and brings it to one of us with an irresistible, “let’s go” expression. There couldn’t be a clearer communication of desire. Delighting in her spontaneity, I say “YES!” to mine. More play, more giggles, yes please! And the countless naps! Quiet naps. Soft-snoring naps. Eye-lids dancing, tail wagging, little yips while dreaming naps. First, she chooses the right spot to curl up or to spread full out, having many “right” spots. Near the front door, she pulls a shoe over, close to her nose. Not chewing (thanks to a wonderful trainer, we made it largely unscathed through the puppy-chew stage), just having the familiar, human pack member scent in her nose as she sleeps. Whatever brings canine comfort, Tara knows how to find it. Witnessing Tara has helped me notice how often I ignore my body. Long stints at my art table–where I loose myself in creative play–I forget to get up and stretch, drink water, or eat. Same, when I’m writing at the computer. For sure, the result for me is exhaustion. There’s a better way…Tara’s way. Notice what’s right in front of me. Eat. Play. Love. Nap. And repeat. I am practicing this exquisite way of Being. My Animal Body loves it! Also, my Mind, my Psyche, my Soul! A magazine article about the animal-human connection crossed my door this morning. The headlines: “We may be their caretakers, but they take care of us too, inspiring us to be our better selves.” To this I say a reverential, Amen!